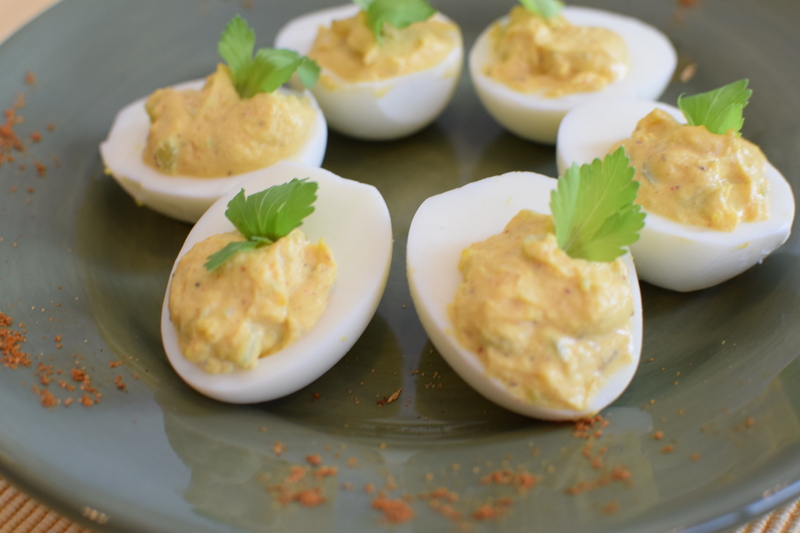 Deviled eggs are always a favorite appetizer when we have a party and no matter how many we seem to make, they are always gone before the night is over. 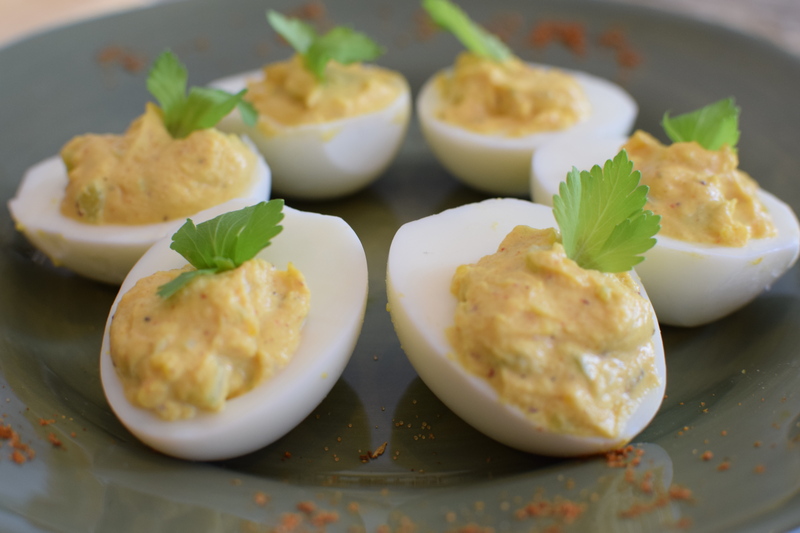 Especially this time of year, using boiled eggs to make deviled eggs or egg salad is always a good idea and this recipe takes a slightly different twist on the classic. Old Bay Seasoning is something that is quite common on the east coast, but usually for seafood, so using it with deviled eggs added a unique and unusual flavor. The same recipe can easily be altered to make egg salad sandwiches, simply by chopping the eggs up and mixing in all of the other ingredients. Peel the eggs and cut them lengthwise. Spoon out the yolks and place them in a bowl. Mash the yolks with the backside of a fork and add the mayonnaise, celery, Old Bay, and mustard. Continue to mash the yolks with the ingredients, slowly adding the milk, until it is smooth and creamy. Season the mixture with pepper. With a spoon, fill the yolk cavity in the egg white with about a tablespoon of the yolk mixture. Top with a celery leaf or sprinkle with a tiny bit of Old Bay prior to serving. This entry was posted in Recipes and tagged appetizer, boiled egg, cooking, deviled eggs, egg, egg salad, Food, food photography, Old Bay, snack. Bookmark the permalink. Those are traditional for Marylanders! We actually met each other and lived in Ocean City for a while, but can say that we never had them until now. They are good, though! Fabulous! I’m surprised the milk doesn’t make them runny. Sounds good. Never tried Old Bay Seasoning, but will have to look for it. Your post made me laugh as you know, we are buried in snow. Decided to bake lemon chicken and make deviled eggs. Of course had to add the in season asparagus. Deviled eggs must pop into Colorado minds when there is a blizzard. Think I have 2 feet in back yard and I live in town. Will try your eggs. Thanks for the suggestion. Yes, blizzards must make us think of deviled eggs. We got over a foot here on the north end of the Springs 😉 Enjoy.